Four weeks ago I rested between my intervals day, my long run day and my tempo day, for the first time in many weeks. During those prior weeks I was running two of those three workouts without a rest day between them. I felt alright during those back-to-back workouts, but I really felt exhausted for two or three days after them. Three weeks ago I rested two days between the long run and the tempo run and one day between tempo and the intervals, then 2 days between the intervals and the long run again. I was gratified that I felt much better during the whole week. Two weeks ago I rested 1 day between the long run and the tempo run, and 1 day between the tempos and the intervals and found it wasn’t quite enough rest; I felt more tired during the intervals this week than last. My conclusion: there aren’t enough days in the week! Just joking! Two weeks ago I rested in the same manner as three weeks ago: 1 day between the long run and the tempo run, and 1 day between the tempos and the intervals. But that time I felt better during the intervals than I did three weeks ago, and I ran the 400s 2 seconds faster than three weeks ago and had a lower maximum heart rate. I’m guessing that’s because I was still tired three weeks ago after several weeks of no rest between two of the three weekly workouts and it took another week with rest between each workout for me to fully recover. Early last week I did a Tempo run, and then mid-week we traveled to the island of Lana’i, in Hawaii, which is undergoing major development under the tutelage of Larry Ellison of Oracle. He’s already refurbished half of the Four Seasons on Manele Bay and has closed the Four Seasons at Koele, up the mountain in Lana’i City. He’s also considering building a third hotel on the undeveloped side of the Island, facing Maui, but one of the local residents mentioned it would be too exposed to the elements. We stayed at Manele Bay, and there really is no flat stretch to run 400 meter repeats. The best I could find was a stretch that was mostly downhill in one direction and (obviously) mostly uphill in the other, along the access road to the Four Seasons. Running downhill was great! I shortened my stride and increased my turnover with the greatest of ease! But it was a totally different story going uphill. I expended more effort, but my time was 10 percent slower! The tempo and the intervals were the only running I did for the week. My cross training consisted of 2 rounds of golf, one at the Kapalua Plantation Course, annual site of the year-opening PGA Golf Tournament, with its magnificent views of the ocean and the mountains. The second round was at the Ka’anapali Royal Course, a flatter tract, but still has some nice ocean views. This week was the second consecutive one of only two workouts, one of intervals and one long run. The intervals seemed more difficult, partially because of jet-lag and partially because I ran them at a faster pace. The long run came after a two day rest and I covered the 6.15 miles easily. My plan for next week is to get back up to three workouts, with at least one day’s rest between each one. Let’s see what happens. Thanks for logging on today! Please join me again for my next Blog on Running, Writing, and Traveling For Life, plus Episode 7 of Mr. Wugidgem and the Faces of Freedom. December was a difficult month, which actually was probably a good thing. First I had to deal with jet-lag after a down-and-back trip to Canberra, Australia. 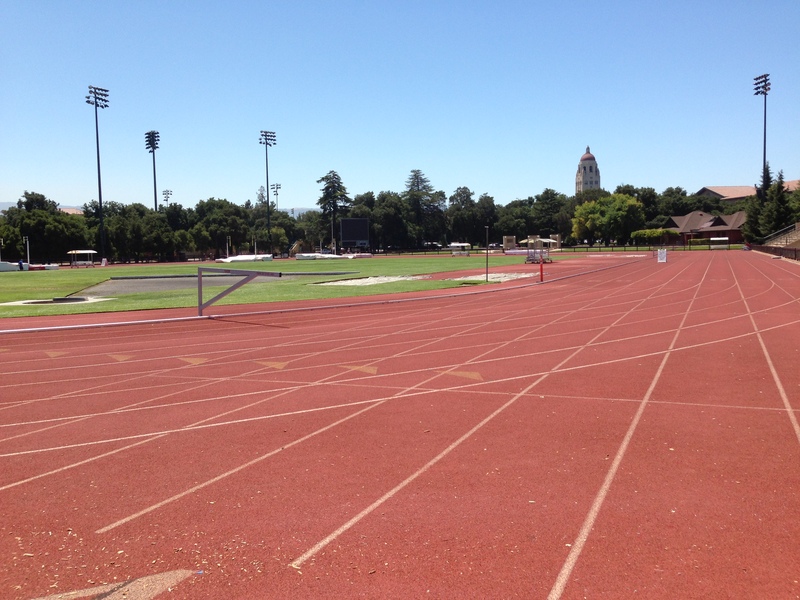 Then I kept trying to run 200s and 400s at my desired 800 meter race time, which left me further exhausted. After that, most of my running was easy, and the few intervals I did were at a slower pace. And I had a lot more rest days because I paid attention to my fatigue and only walked, golfed, or rested when I didn’t feel up to running. Now it is January, and I feel more rested. In fact, this week I have felt the strongest in months. I was able to handle a long run, and then an interval workout in 2 consecutive days. I am hoping I can build slowly, but steadily in the coming months. I have also been thinking about my next novel. I have been quite disturbed by world-wide terrorism, murder, bigotry and greed, and I have been trying to understand the root cause. I think about poverty, drugs and alcohol, insanity, lack of education, being spoiled, sexual drive, and myriads of other circumstances contributing to the chaos in the world. When I was doing my prayers and meditations this week, I had an epiphany that all of these heinous acts and states of being have to do with power. Or more specifically, the lack of power. I want to investigate further. How does one gain power in healthy ways? Is the best power external or internal? Is win-win really possible? DIRECT LINK TO MR. WUGIDGEM AND THE FACES OF FREEDOM-EPISODES 1 AND 2.